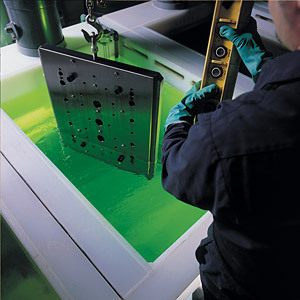 All of our electroless nickel plating processes meet the appropriate specifications and requirements. Electroless nickel deposits are covered by MIL-C-26074 entitled, "Coatings, Electroless Nickel, Requirements for" and by SAE specifications AMS 2404A and AMS 2405. These electroless nickel plating standards spell out the requirements for the final coating and not the requirements of the solution or the process used to obtain the coating. The requirements of specification MIL-C-26074 call out specific thickness, sampling procedures and special treatments such as baking for the relief of hydrogen embrittlement. These, of course, are under the control of the plant doing the actual plating and not under that of the supplier of the plating solution.